So, I did what every scared 10 year old boy would do in front of his friends…I pretended my bike was messed up and sent my trusty steed down the ramp without its hero. Which, of course, left me perched at the peak of Everest with a bruised ego and a new plan. I would take the downward slide on the back-side padding the Good Lord gave me…Can you imagine where that left me? Every inch I descended, toward what I thought would be glory, fame, and fortune on the sandlots of South Roxana, left me with small splintered reminders of my downward slide. Those words could just as easily have been written on June 2, 2017. The phrase “Down-Grade Controversy” may have been coined for Spurgeon and his battle but the American Church faces its own downward slide today. The American Culture & Faith Institute’s most recent study reveals a terrifying reality of spiritual adultery in the American Church and the virtual abandonment of a biblical worldview (https://www.culturefaith.com/groundbreaking-survey-by-acfi-reveals-how-many-american-adults-have-a-biblical-worldview/). This downward slide has generational consequences. The spiritual adultery (James 4:4) of the greater American church has left our pews virtually empty of two to three generations. What’s even worse is that this is indicative of their relationship with God through Jesus Christ; empty, void, absent. I am on the cusp of the Gen-X and Millennial generations having been born in 1979. Regardless of where a researcher places me, my generation slides down the half-pipe on our splinter-ridden rears to an abysmal 4-7% espousal of Christian Orthodoxy and a Biblical Worldview. Take those adulterous numbers and pass that down to the Mosaic’s (18 and under, children of Millenial & Gen-X) and you’ll find that 0.5% of our latest generation see the world through biblical lenses. Spurgeon was right, “the house has been robbed.” And it’s being robbed by the very fathers and husbands who God has tasked with spiritual leadership of their homes. Abidcation is the sin and apostasy is its fruit. Thankfully, the words of our Lord Jesus Christ will ever ring true: “…the gates of hell shall not prevail against [my Church].” Take heart, brothers & sisters, everything is not lost. The Lord Jesus himself assures us that the will of the Father is that he “should lose nothing of all that he has given me, but raise it up on the last day.” With this confidence of assurance in Christ’s work, what then shall we do? Let us, as reformers, turn to the inspired, inerrant, authoritative, sufficient, Word of God to give us direction. Resist—Resistance is, as Kurt Richardson suggests, a defensive posture. To actively resist the devil is to consciously secure a victory. Follow Christ’s model of resistance with God’s Word as your sword and faith as your shield. Draw Near—Unlike the human heart, the heart of God is not repulsed by the wretchedness of man that approaches him in confession. Instead, as we actively draw near to the Throne of Grace, in repentance, the Father draws near to us as he runs toward us to welcome us home & clothes us with his ring & his robe. Cleanse & Purify—These deliberate consecrating actions deliver the word picture to the mind of the Old Testament priests who would take intentional steps to remove the physical filth from their bodies that represented the spiritual filth of sin before they would approach God. Wretch, Mourn, & Weep, Change from Laughter & Joy to Mourning & Weeping—A broken and contrite heart will not be despised by our Gracious God. The Church needs a new relationship with sin; perhaps not a new but biblical one. May God find it in his gracious love to grant us a national, godly sorrow that leads to repentance. Without his grace, we, our children, and our children’s children will find that we have more than plintered bottoms; our families will have an eternity separated from a loving and gracious God. Lord, let that not be found in my home. I have an iPhone. I’m sure some of you do too, if you haven’t jumped on the Android train. Either way, life in our current time is different from other generations that have gone before us. Why? The smartphone. It’s whatever you want access to anything on the planet in your pocket. This can be used for great good, or for great wickedness. How we do use our smartphones for God’s glory and the good of others around us? Always connected to the web, always connected to social media, a smartphone with a camera is the most addictive tool of communication ever invented.Packaged with all its potent blessings come the amplification of its curses. Our phones can allow unnecessary habits in the silent spaces of our lives. And our phones can feed the most insidious impulses that live inside of our hearts.We all seem to sense that — for good or bad — our smartphones are changing us, our habits, and our relationships. We all know it. We feel it. We seem to be more productive, and yet we are more distracted. We seem to be more connected, and yet we are more alone. We seem to be more knowledgeable, and yet we are less likely to understand the very purpose of our lives.The more important questions are these: What can be done about it? And do we Christians have anything relevant to say to the perplexing questions facing our digital age?After three years researching and writing my new book on smartphone habits, I say emphatically: Yes!Let me show you the relevance of the Bible for the “never-offline” smartphone generation. And am I succeeding or failing at it? Technology will not answer these four foundational questions of life.Scripture does. Luke 10 is a good example of Scripture’s relevance in the “never-offline” culture. The chapter begins with Jesus sending out 72 disciples to preach the gospel. All social media gospel spreading in the digital age really can be traced back to the democratization of the message in this sending moment (Luke 10:1–24). I’ll pick up the story in the next scene, in Luke 10:25, what we call the parable of the Good Samaritan. Love God with all that you are. Jesus commends the lawyer’s summary. He’s right. Here’s the primary love command: Treasure God with everything you are! This is the chief vocation for humans. We were created to express a heart-soul-strength-mind, holistic embrace of God. Faith is a response to seeing God’s glory and goodness. In the light of his beauty, faith desires nothing on earth more than him and cherishes him above even the most beloved father or mother or son or daughter. Faith joyfully gives all our earthly assets in this life to buy a field that holds the priceless treasure of Christ. Faith considers everything in this life as loss compared to the supreme worth of knowing Christ. That is saving faith. It is seeing and hearing and tasting and touching — holistic metaphors for all the various expression of how faith is treasuring God with all that we are and all that we have (Psalm 34:8; 73:25–26; Matthew 10:37; 13:44; Luke 10:27; 14:33; John 6:35; Philippians 3:8). In the words of Piper: “Jesus’ demand to love God with all our heart and soul and mind and strength means that every impulse and every act of every faculty and every capacity should be an expression of treasuring God above all things” (What Jesus Demands, 82).This is our primary vocation — and it’s a lofty one.Now, the lawyer knows that a whole-life embrace of God is the most important thing in the universe. What the lawyer doesn’t see is that this expression of faith is nothing short of a miraculous gift of God’s sovereign grace. Here’s the second love command: Love your neighbor as yourself. This is the resulting human vocation, which comes out of the first vocation.Love God.Love others.These are the two pillars of all human flourishing — true in the Old Testament, affirmed in the ministry of Jesus, and no less relevant for digitally savvy Christians today.By affirming these two love commands, Jesus is saying that these are the two load-bearing commands — on them “depend [or hang] all the Law and the Prophets” (Matthew 22:40). So, if you lose the second pillar (to love your neighbor), ethics will collapse and crumble into a heap of pious religious jargon that fails to demonstrate the value of God in service to others. Or, if the first pillar crumbles (to love God), ethics collapses into secular social work that cannot, and will not, give expression to the overflow of God’s all-satisfying beauty.All human flourishing rests on these two pillars. The image of a dying man in the street is so relevant today, after the terror attacks in Boston, Paris, and now in London and Russia. Sadly, it has become a universal experience to see pedestrians bleeding out on public streets.Now, the lawyer himself misses the whole point — he’s not searching for justification in a Savior; he’s seeking self-justification in front of the Savior. This whole episode for the lawyer will make no sense until he sees Jesus inside the story. Those with eyes of faith will see that we are the man in the gutter of sin and desolation. The pressures of the world, the sinfulness of our flesh, and the conniving of the devil have jumped us, knocked us out cold with brass knuckles, and left us in total ruin and death.In the cross, we find Christ as the Greater Levite. Christ is the Ultimate Mercy Giver. Christ is the Ultimate Neighbor. Christ is the Greater Priest who does not stand at a safe distance near the Purell dispenser. He draws near to me to get his hands dirty and to shed his own blood for me while I am in my most broken place. The One born in a barn because all the hotel rooms were booked is the Savior who makes for you an eternal home in his Father’s house. Don’t miss the echoes of Jesus in this parable.In other words, “you’ll never become a radical neighbor for others until you see that you have been radically neighbored by Christ” (Keller). So, this text answers the question: Who is my neighbor? That phrase, “your neighbor” — appears over 60 times in the Bible, mostly in Leviticus, Deuteronomy, and Proverbs. The stress, as Jesus points out here, is on embodied place-ed-ness. For the purpose of an illustration, imagine that you and I, who don’t recognize each other, are sitting inside the same Starbucks coffee shop. At that moment, I exist in the room, and you exist in the room. This is where our bodies coincide. At that moment, we become neighbors in a way that we were not neighbors earlier in the day, not because we follow one another on Twitter, but because our physical presence now overlaps in proximity.Embodied place-ed-ness.Sitting as apparent strangers in the same room, we are neighbors. In this moment, we are now responsible to care for one another. If one of us needs medical attention, the other is obligated to offer help, and to not walk away.My point is that neighboring is rooted in space and time. To have a body is to be obligated to others. We have obligations to our parents, perhaps to a spouse, to children, to a local church, to a boss, and to a neighborhood. And in many of these situations — in the home and church — we have gender-specific obligations to one another. To be a creature is to be obligated to others. That’s fundamental to neighboring.But in the digital age, when we lose a sense of our bodies, we quickly find ourselves in isolation from others, and our sense of what it means to be a true neighbor evaporates.The resulting fallout of this isolation is why the Surgeon General of the United States, Vivek Murthy, has made it his mantra: “The most prevalent health issue in the country is not cancer or heart disease or obesity. It is isolation.” Social disconnection. Even in those areas that most root us — our marriages and jobs — our culture has taught us the dance of having one foot in and one foot out never quite committed to anything. We like to keep our options open.So, when a beaten neighbor is lying on the metaphorical path of our lives, we are quick to jump over to the sidewalk of escape on the other side of the street. For many of us, that escapism is found in the virtual world of our smartphones. All of these points in Luke 10 link our evolving smartphone habits to the ancient parable of Jesus.Here’s the point:The priest sees the man in the street, but he’s rushing off to God’s temple to dispense his priestly work. He’s clean, pure, unsoiled, and perhaps his shift begins soon — so he absolutely cannot stop to dirty himself with this filthy, bloody, dying guy in the street. The Levite sees the man, too, but he’s apparently running late for his preaching gig. He cannot stop for the same reason: ministry expectations beckon for his faraway attention. You begin to see the problem here rather quickly. Setting your mind on good and noble things, like remote ministry possibilities, can eventually callous you to the flesh and blood needs around you.Giving over your attention to virtual possibilities, even finding an important role online, can blind you to the gospel needs lying at your feet.If that is not a prophetic warning for Christians in the digital age, I don’t know what is. Jesus clearly wants the lawyer to see the sin of his own neighbor-neglect and repent. In this parable we see the sin of our smartphone abuse, the sin of our hyperconnectivity to the virtual world — even in performing good ministry online. We so often are tempted to withhold mercy from those around us — our families, our roommates, our colleagues, our classmates, our church members, and yes, our neighbors.Neighboring, defined by Jesus, puts great stress on how our bodies root us in a particular place, as both gift-getters (receiving mercy) and gift-givers(offering mercy).Radical neighboring is embodied neighboring. Face-to-face. Real needs met. And there is no exemption clause because you have five hundred followers online. Taken together, Luke 10 says to all of God’s disciples: Yes, like the 72 sent out, go into the digital world as far as your online influence will spread, and proclaim the good news of Christ — but — don’t get so wrapped up in those opportunities that you forget your essential vocations: (1) to cultivate a genuine love of God above everything, and (2) to care for the needs you see immediately around you. To put it another way, you can fake online authenticity for a while, but not forever. It will catch up to you. Our authenticity offline is always the basis for our authenticity online.So, if God has called and equipped you to be a Twitter sage, or a hip-hop artist, or an Instagram evangelist, or a podcaster, or a writer, or a social media social activist, or a digital creator of any type, you must take breaks from the scuttle of those ministry expectations — those expectations out in the remoteness of the virtual world — in order to reconnect with the ultimate purpose on this planet that grounds all our flourishing: To be embodied children of God, feeding our faith on the truth of God, cherishing him with our entire being, and then, out of our abundance, serving our neighbors. Tony Reinke (@tonyreinke) is senior writer for Desiring God and author of 12 Ways Your Phone Is Changing You. He hosts the Ask Pastor John podcast and lives in the Twin Cities with his wife and three children. Today marks a wonderful day in church history. October 31, 1517 is the day Martin Luther nailed his 95 theses on the church door in Wittenberg, Germany. To make much of Luther today I want to discuss Halloween? Why? Because Luther was known for mocking the devil, and that is precisely what Halloween is all about. I am fully aware that within the Church there are differing views on Halloween. Some believe that dressing up like goblins and ghouls and asking for candy at every door in the neighborhood is completely sinful. As a consequence for believing in the sinfulness of Halloween, some churches have therefore created events such as “trunk or treat” or had a “fall festival” to allow the kids in the congregation to have fun in a “safe” manner. Isn’t it a double standard to believe Halloween and it’s activities are sinful only to participate in an event at church where one does the same Halloween activities one does in the neighborhood? It is. Not only do I think this is wrong, I think it’s historically ignorant. All Hallows Eve was a celebration the Church invented to mock the devil and his minions by dressing up like them. This day would be followed up with All Saints Day on the following day to celebrate what Jesus did in creating His Church. But, I do think that’s not the real issue at hand here, there’s a deeper idolatry. When you get down to it, I believe the heart that wants to participate in a “trunk or treat” or “fall festival” is a heart that wants to avoid non-Christians, the great commission, and being a light in the darkness among our lost neighbors. Rather than going out into the community to be a light in the darkness, or continuing to develop friendships and relationships for gospel purposes with our neighbors, we choose to do the “safe” thing and go to church. This leads me to a question: should the church allow people to avoid the world by opening it’s doors more? No. We ought to meet for worship, we ought to meet for Bible study, we ought to meet for prayer, we ought to meet in small groups, etc. – these things are good, godly, and great ways to fan our faith into flame. But when the church opens its doors and seeks to create a “Christian-ized” version of normal world holidays it seeks to remove itself from the world and allow its members to delve deeply into isolated Christian bubbles. This is not healthy. What, therefore, should you do on Halloween? Do something with your neighbors. Invite your lost friends to do trick or treating with your family around your neighborhood so you can continue to get involved in the lives of the lost people around you. Bottom line? Don’t isolate yourself in a Christian bubble. Yesterday was the 150th anniversary of the assassination of President Abraham Lincoln (April 14, 1865). Here is an FAQ on some aspects and background of the tragic murder. 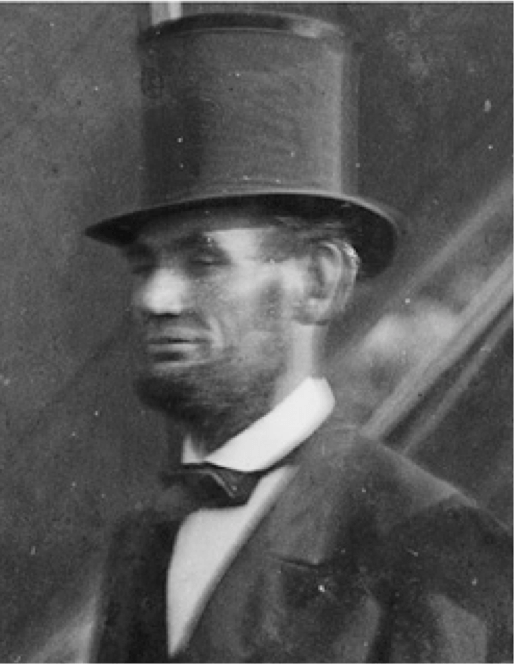 What is the last known photograph of Abraham Lincoln alive? Harold Holzer has convincingly shown that the last close-up photograph of the president alive was taken outside on the south portico of the White House by photographer Henry F. Warren (Waltham, Massachusetts) during the late afternoon of Monday, March 6, 1865—two days after his second inaugural address and six weeks before he was killed. 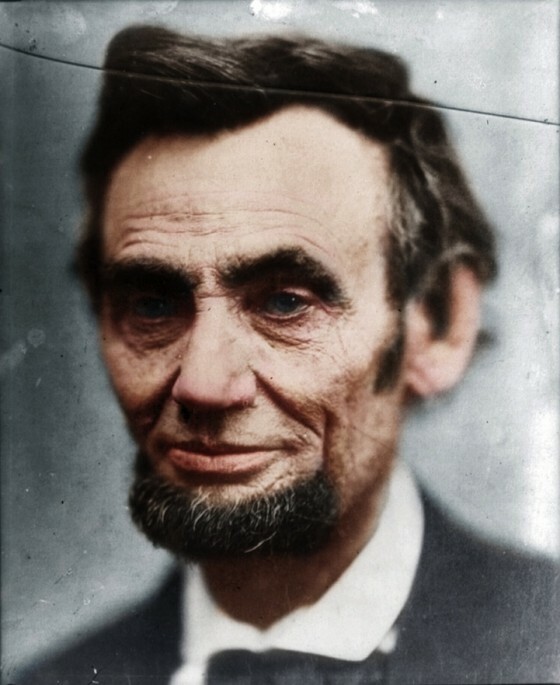 The following photograph, previously thought to be the final one of Lincoln, was taken in a studio by Alexander Gardner on Sunday, February 5, 1865, and was recently colorized by Mads Madsen. It is a more detailed and iconic capturing of the war-weary 56-year-old Commander in Chief. What is the last thing Lincoln is known to have written? 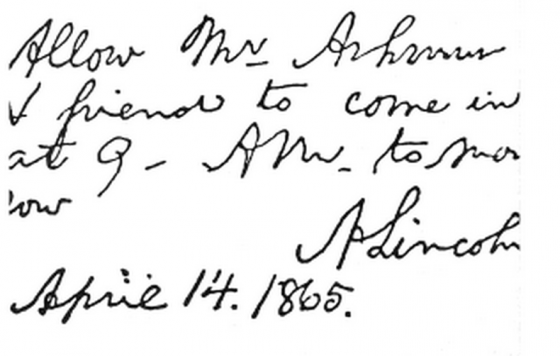 Transcription: Allow Mr. Ashmun & friend to come in at 9- AM. tomorrow. A Lincoln April 14. 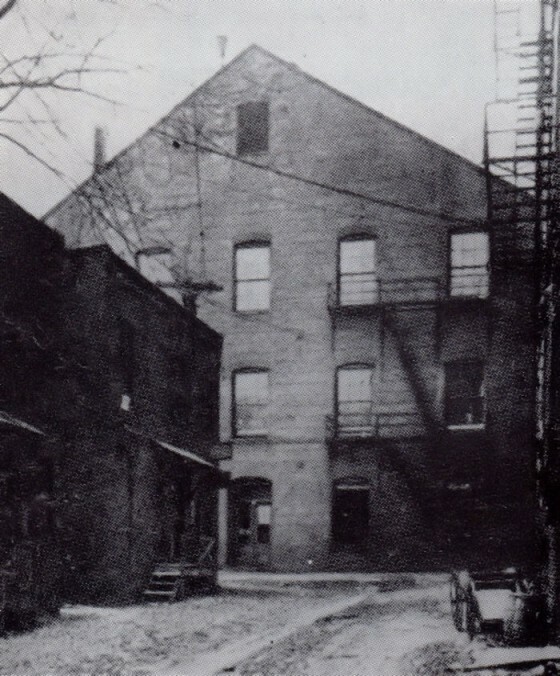 1865. What were Lincoln’s final words? 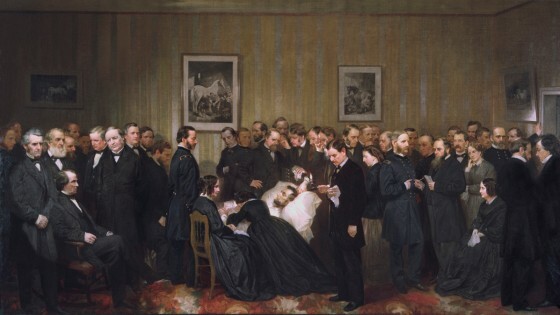 Mrs. Lincoln later recounted the conversation to a friend, who recorded it in a letter. What was happening during the Civil War in the spring of 1865? 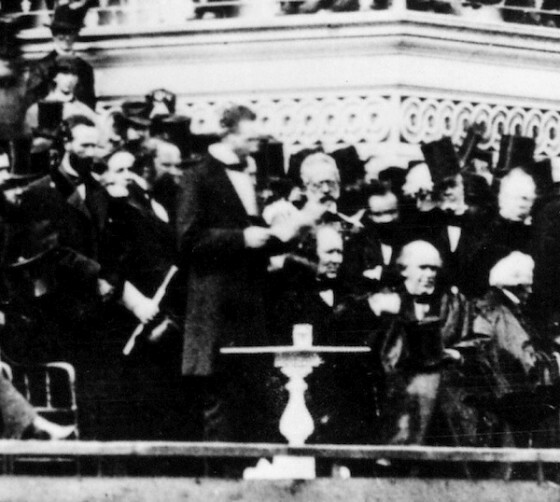 On March 4, President Lincoln had delivered his second inaugural address at the east front of the Capitol. 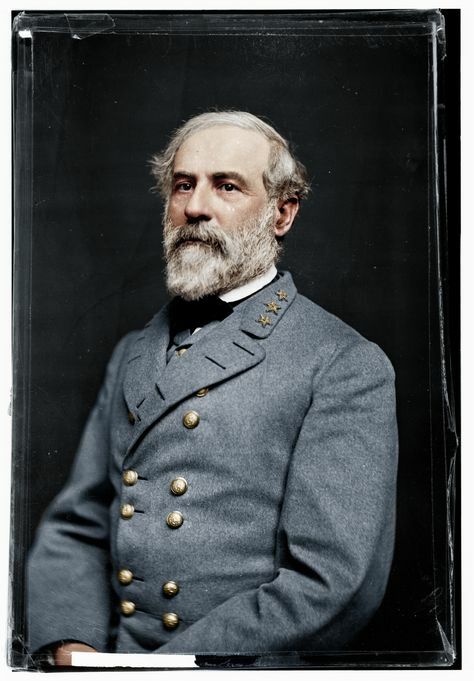 On Palm Sunday, April 9, Confederate General Robert E. Lee had surrendered the Army of Northern Virginia to Union General Ulysses S. Grant in the parlor of the Wilmer McLean’s house in the Appomattox Court House in Virginia. 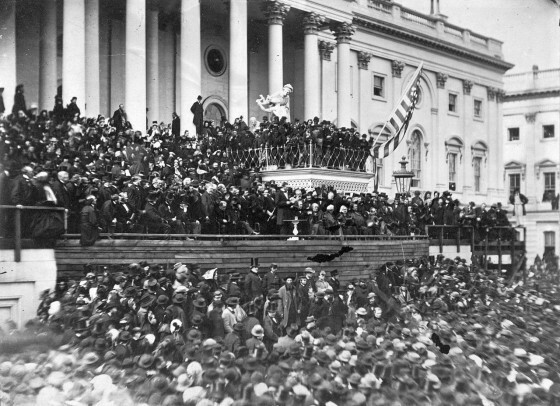 Two days later, April 11, Lincoln gives his last public address, speaking to a large celebratory crowd gathered outside the north face of the White House while standing at the hallway window been the two bedrooms. Lincoln proposed suffrage for certain blacks. Had Booth and Lincoln ever met? There is no evidence they ever met. 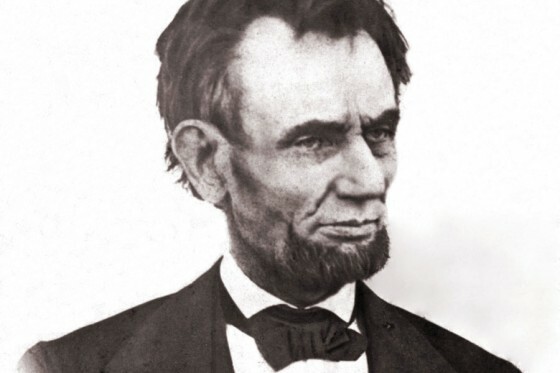 But Lincoln had seen Booth (acting in plays), and Booth had seen Lincoln (giving speeches). Although this makes for a dramatic photograph—the would-be assassin staring down at his eventual victim several feet away—I seriously doubt this is Booth. The resolution of the photograph is not sufficient to make a positive identification. 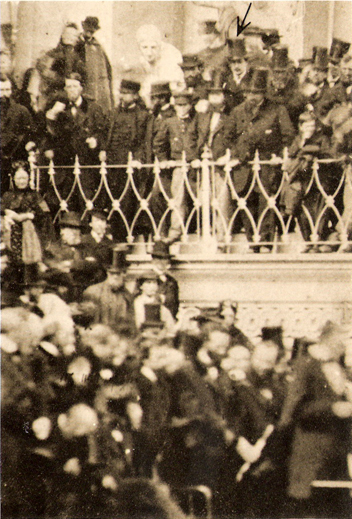 While the figure in the photo has dark hair and a mustache, there were undoubtedly numerous men at the inauguration with those identifying features. Booth had a high receding hairline and prominently parted his hair on the left; the figure in the photograph has his hair parted on the right and his hair is longer than Booth’s. He is also not wearing a hat, something that would be highly unusual for a formal outdoor event attended by the fashion-conscious debonair actor. Finally, I’ve never heard any positive claims for why this man that doesn’t really look like Booth is actually Booth himself. 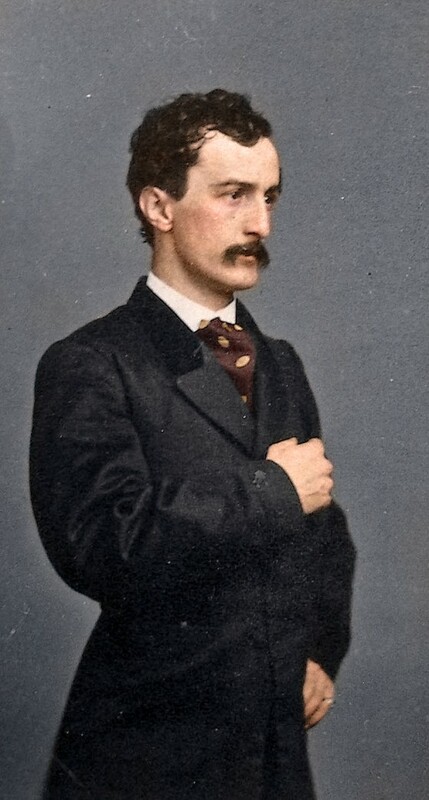 In short, there is no good reason to believe this is John Wilkes Booth. 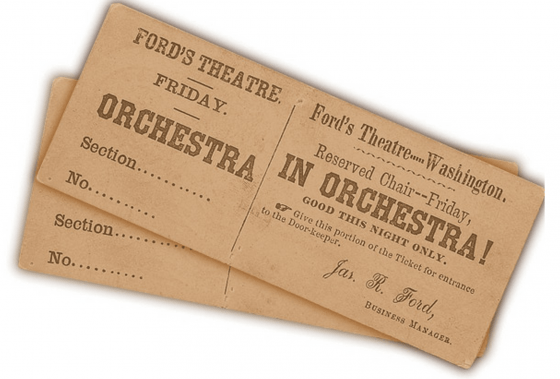 Whom did the Lincolns invite with them to Ford’s Theatre on Good Friday, April 14? 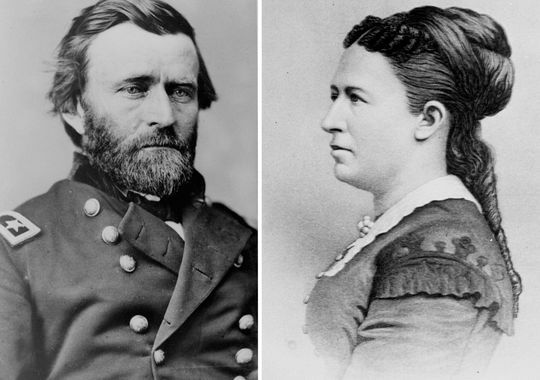 During a Cabinet meeting that morning at the White House, Lincoln invited General Ulysses S. Grant and his wife, Julia, to join him and his wife that evening at Ford’s Theatre. Grant accepted but with a caveat: if he finished his paperwork early enough, he and Mrs. Grant wanted to catch the early train from DC to New Jersey to spend time with their children, who were attending school in Burlington, NJ. Many claim the real reason for the decline was that Mary Todd Lincoln was unpleasant company, having socially alienated many in her circle. And it’s true that just a month earlier Mrs. Lincoln had berated Mrs. Grant. This is ultimately speculation (which doesn’t make it untrue), and there is no documentary evidence from the Grants that this was the real reason. Telegrapher David Homer Bates wrote in his memoirs that Secretary of State Stanton tried vigorously to persuade Lincoln not to attend the theatre that night, citing security concerns, and later did the same with Grant, urging him to persuade the president to avoid the unnecessary risk. It is not unreasonable to think that all of these reasons—Julia Grant’s view of Mary Todd Lincoln, Edwin Stanton’s objections, and the Grants’ desire to see their children now that the Confederate Army had surrendered—combined to prevent them from attending. In any event, John Wilkes Booth saw them leave town that afternoon, even though many attending the play “Our American Cousin” that night expected to see the General, who may have been an even bigger attraction than the President. What was “Our American Cousin” about? It was a three-act farcical comedy written by English playwright Tom Taylor in 1858. The character Asa Trenchard—an awkwardly boorish American (played at Ford’s Theatre that night by Harry Hawk)—travels to England to claim the family estate and encounters his aristocratic English relatives. Did the Lincolns ask others to attend? Lincoln also asked Major Thomas T. Eckert, assistant secretary of war and head of the telegraph office of the War Department. But Eckert knew of the strong disapproval of his boss, Secretary Stanton, and declined. There are half a dozen or so other people who claimed that the President asked them to attend the theatre with them that evening. But the Lincolns did find a willing couple: Major Henry Rathbone (27 years old) and his fiancée/stepsister Clare Harris (30 years old). 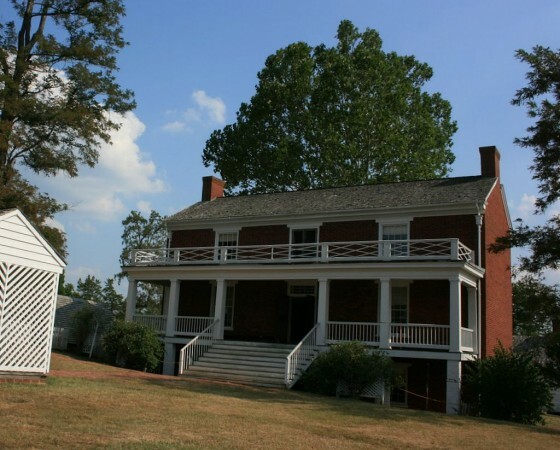 As the Lincolns prepared to leave, they asked their son 21-year-old son, Robert, home from the War as a Union Army captain, if he wanted to attend, but he responded that he was quite tired and wanted to rest. 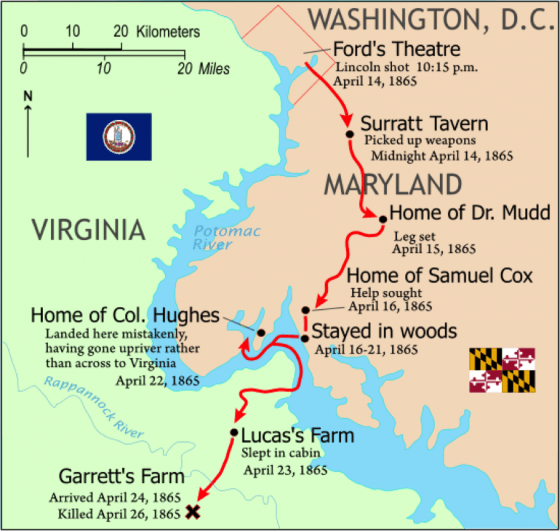 How did they get to Ford’s Theatre? 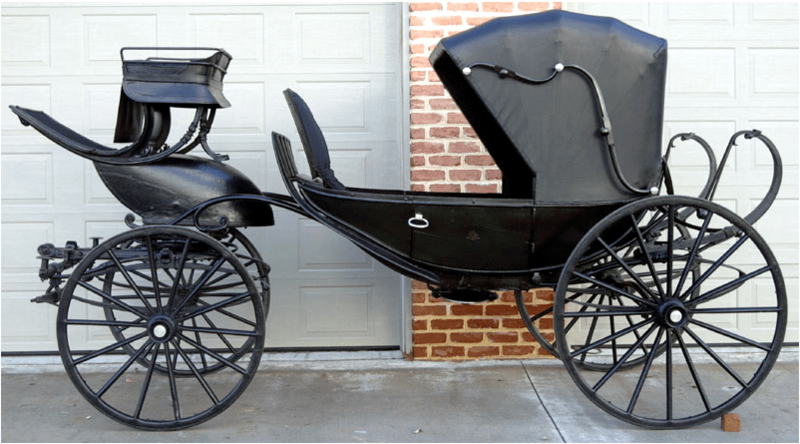 The black open barouche model carriage had four wheels and was horse-drawn. The rear half had a collapsible roof, and seats facing each other for the passengers. There were seats in the front for the driver and a companion. Did anyone else accompany the Lincolns and their guests to Ford’s Theatre? Traveling with the party were Francis P. Burke, the president’s coachman, and Charles Forbes (1835-1895), the president’s messenger and footman. Ward Hill Lamon (1842-1912)—Marshal of the District of Columbia, friend of Lincoln, and self-appointed bodyguard to the president—was in Richmond, Virginia, that night, sent by Lincoln to investigate conditions for reconstructing Virginia. 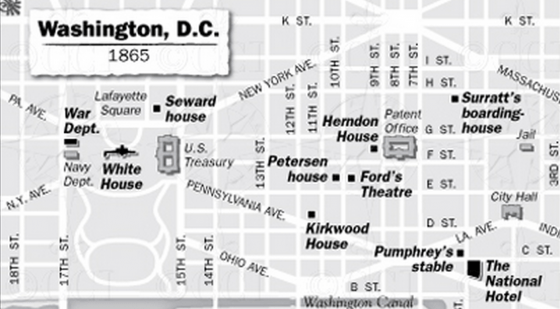 How far is it from the White House to Ford’s Theatre? 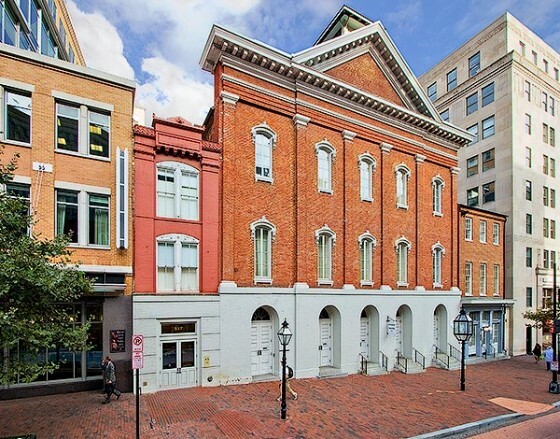 Ford’s Theatre is a half-mile due east of the White House. But it would have been more like a mile after the Lincolns picked up their guests at the house of Senator Harris (at the corner of 15th St and H St). They picked up Major Rathbone and Miss Harris around 8:20 PM and they arrived at the theatre around 8:30 PM. 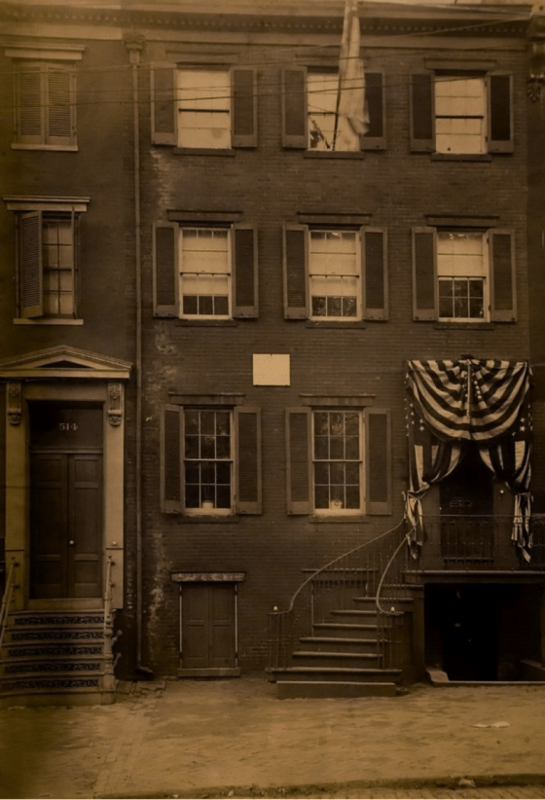 What did Washington, DC, look like in the 1860s? Here is a photograph of the city in 1865, from the corner of 14th Street and B St. NW (present-day Constitution Ave), facing north. And here is a watercolor painting from 1860, on the corner of 6th Street and Pennsylvania Avenue, facing southeast toward the Capitol being reconstructed. The city expanded a great deal between 1860 and 1865, but this gives a sense of the colors and the traffic on a typical street corner. In both the photograph and the painting, note the unpaved city roads. What were the Lincolns wearing? 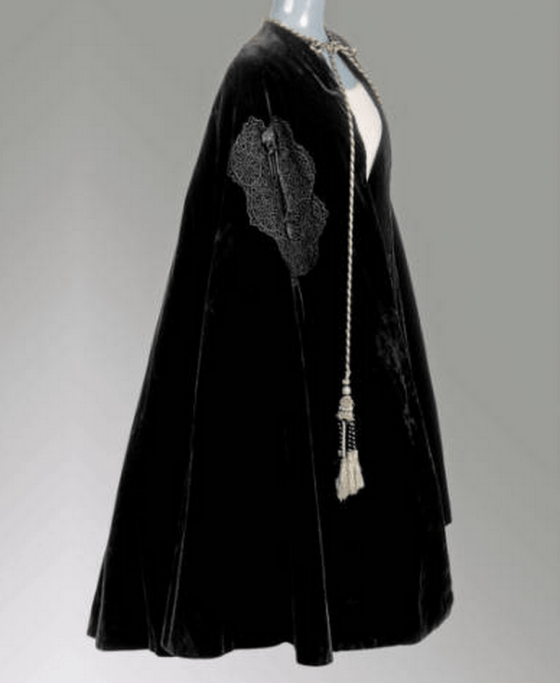 46-year-old Mary Todd Lincoln was remembered to have been wearing a dark bonnet and a light gray (or black) silk spring dress, highlighted with small white flowers, along with a black velvet cape—pictured below and on display at the Chicago Historical Museum. Abraham Lincoln wore a frock coat, waistcoat, trousers, tie, and size-14 shin-high boat, along with white kid cloves. 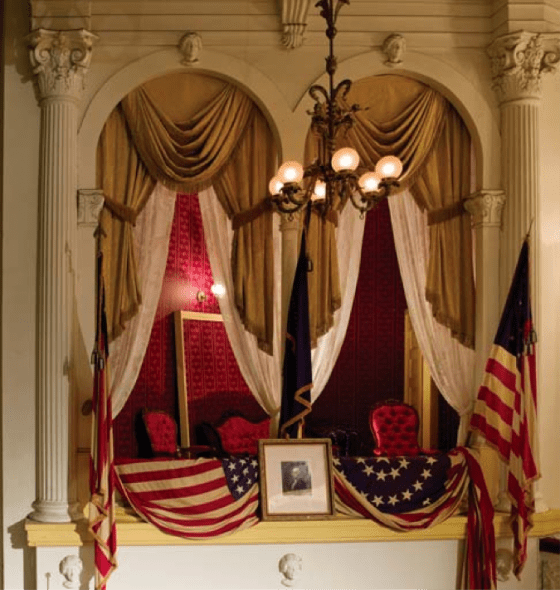 The originals of his clothing that night are pictured below in the Ford’s Theatre Museum. 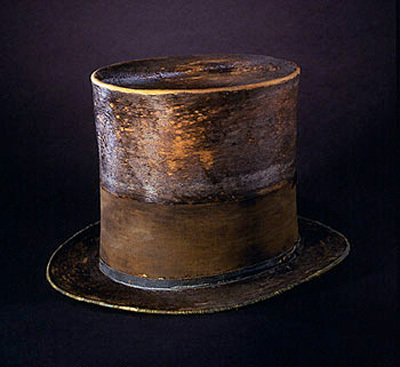 While traveling that evening Lincoln would have worn his black top hat and a greatcoat, which had been custom-made by Brooks Brothers for his second inauguration. 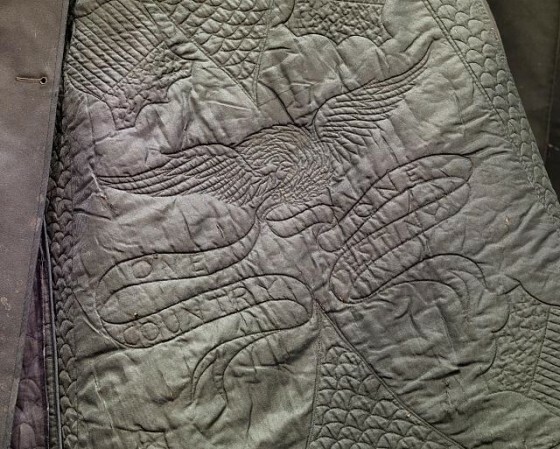 The inner lining had stitching of an eagle and the words “One Country, One Destiny.” At one point during the play he was chilled and stood up to put his greatcoat on. 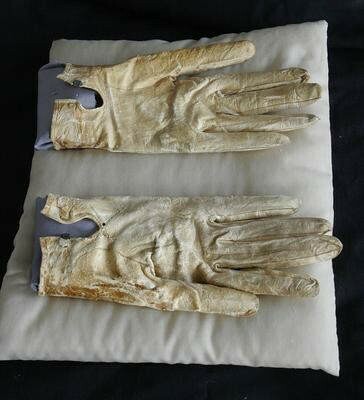 And here are what his gloves look like today. Given the bloodstains on them, he was probably wearing them during the play. You can see the items close-up here. 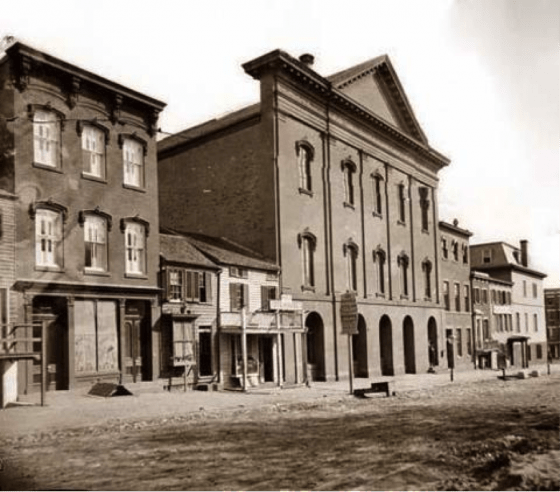 What did Ford’s Theatre look like in 1865? What does it look like reconstructed today? What happened when they arrived at the theatre? On reaching the theater, when the presence of the President became known, the actors stopped playing, the band struck up “Hail to the Chief,” and the audience rose and received him with vociferous cheering. The party proceeded along in the rear of the dress-circle [second-level balcony seating] and entered the box that had been set apart for their reception. 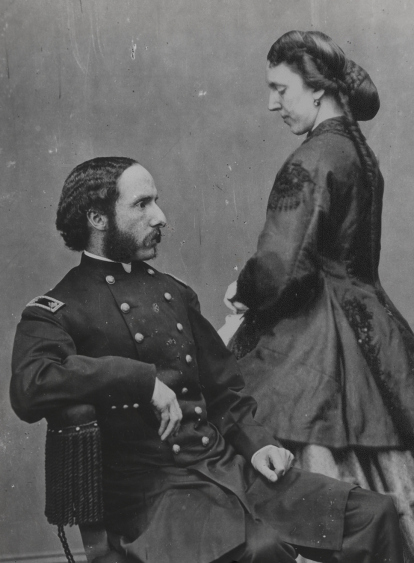 Charles Leale, a 23-year-old Union Army surgeon who had just graduated from medical school, was sitting in the dress circle about 40 feet from the Presidential Box. 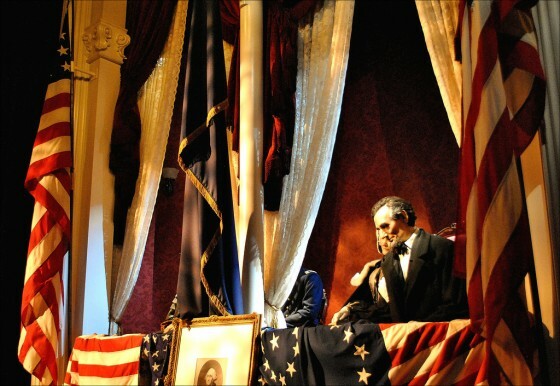 His testimony adds the detail that Lincoln smiled and bowed, reciprocating the audience’s response. On entering the box, there was a large arm-chair that was placed nearest the audience, farthest from the stage, which the President took and occupied during the whole of the evening, with one exception, when he got up to put on his coat, and returned and sat down again. Here is a photograph of the President’s chair—a comfortable Victorian rocking chair, upholstered in red satin—which is now housed at the Henry Ford Museum. 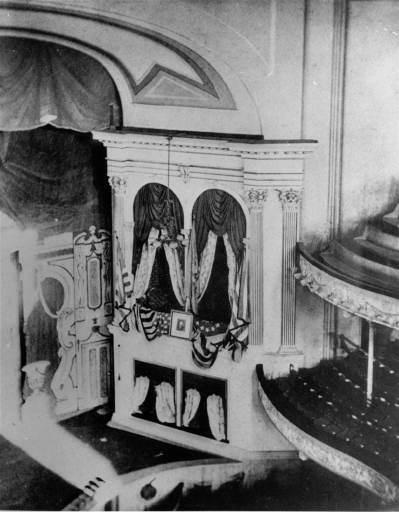 What did the State Boxes at Ford’s Theatre look like? It is estimated that about 1,000 people were there. Good Friday was not a popular night for attending the theatre, but news of the Lincolns (and supposedly the Grants) boosted ticket sales. But tickets were available even after the play began, indicating that the theatre was not packed to full capacity. There was bench seating in the upper balcony (the Family Circle) section of the theatre, so we don’t know precisely how many were in that section. 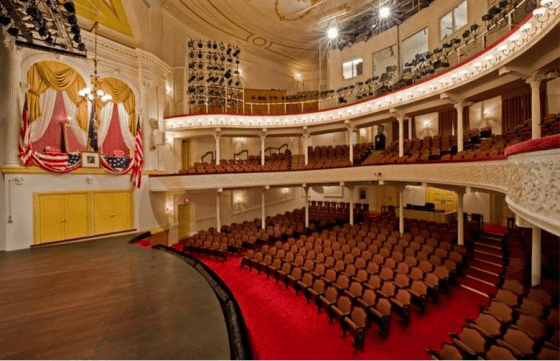 At capacity, the theatre could have held 1,700 patrons. How many state boxes were occupied that night? The only boxes occupied on Friday, April 14, were boxes 7 and 8 (stage right, upper level). The seven-foot-tall, three-inch-thick partition separating the rooms was removed to create a double box for the evening. How was the presidential party arranged? The President’s rocking chair was placed the far left against the wall, so that the left side of his face would have been visible to some in the audience. 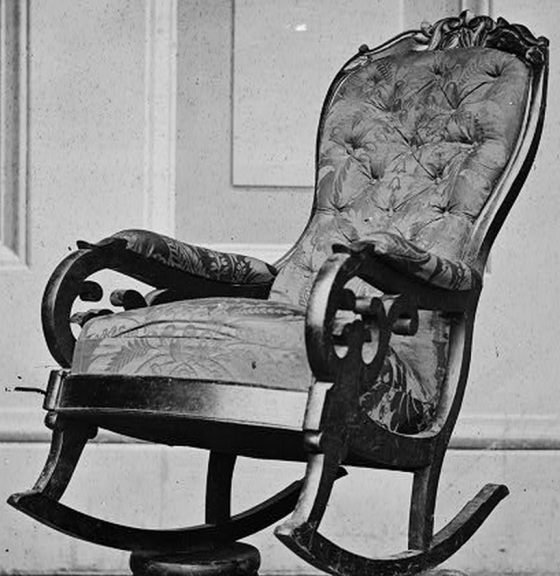 Mrs. Lincoln sat in a carved-back cane-seat chair next to the president’s rocker. Miss Harris sat in the armchair closest to the stage. Major Rathbone sat on the velvet-covered sofa next to but behind Miss Harris and toward the rear of Box 8. What did the exterior of the boxes look like to the actors and guests? What happened to the President’s bodyguard that night? I’ve heard he was drunk or fell asleep or was bribed or was off drinking. There was no Secret Service at the time. As noted above, Ward Lamon, the closest thing the President had to a security detail, was in Virginia that night. John Parker, a Washington policeman, is often blamed for failing in his duty to guard the President. 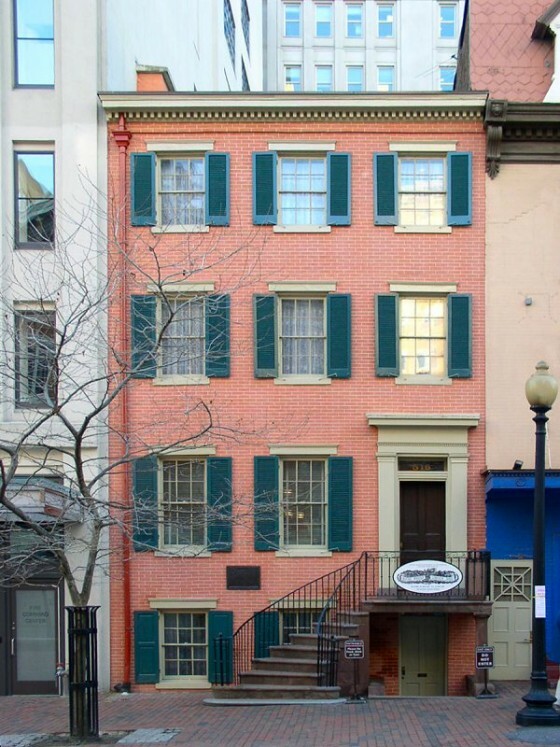 It is said that Parker abandoned his seat near the door outside the entry to the presidential box, either to view the play from a better seat or to get a drink at the Star Saloon, adjacent to Ford’s Theatre to the south. No one knows for sure where Parker was at the time of the assassination, but it was not really his job to guard the president through the night. His duties were to ensure that the President go to his destination and returned to the White House. 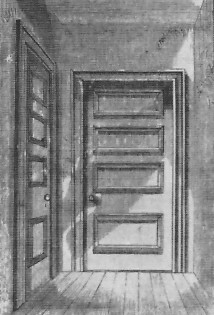 Upon approach the door of the box we [this is an editorial “we”; Hanscomb means “I”] found the passage-way leading to it blocked by two gentleman who were seated upon chairs, about six or eight feet from the door. We requested them to allow us to pass. 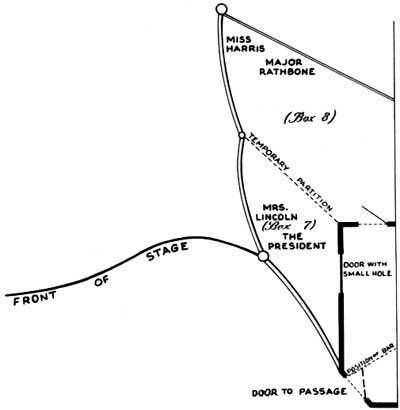 They did so, and upon reaching the door we found no other person belonging to the President’s household than Mr. Charles Forbes, one of Mrs. Lincoln’s footmen and messengers, who was always in the habit of attending the President and Mrs. Lincoln at the theatre. As the play was progressing we requested Forbes to hand the dispatch to the President. It was the last he ever received. At that time there were no guards, watchmen, sentinels, or ushers about the door of the President, and anyone could have passed in without molestation. 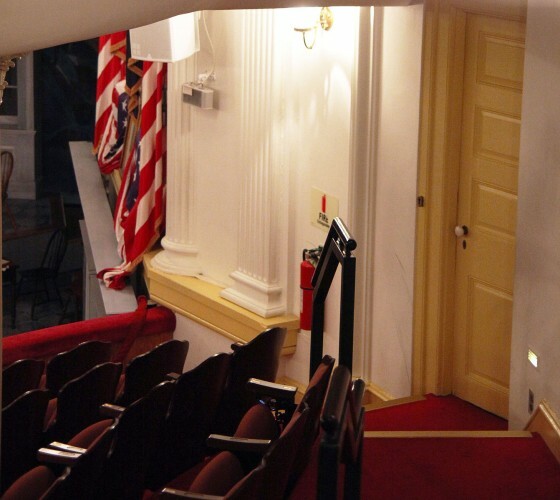 Did anyone witness Booth pass through the door into the vestibule leading to the president’s box? He walked down around the upper row of the dress circle next to the wall. He stopped about two or three steps before he went to the door, then entered the private box, took off his hat and held it in his left hand. He had a black slouch hat which was a hat he often word; stooped down and case his eyes about over the dress circle and the orchestra, stepped one step down, put his knee against the door and opened it. He said he walked in the back part of the box with a small Derringer pistol. There was a soldier or officer trying to prevent him from going into the box, & the thought struck him to draw a letter from his pocket and show it to the man, which he did. The man let him pass. I was sitting in the aisle leading by the wall toward the door of the President’s box, when a man came and disturbed me in my seat . . . he stopped about three feet from where I was sitting, and leisurely took a survey of the house. I looked at him because he happened to be in my line of sight. He took a small pack of visiting-cards from his pocket, selecting one and replacing the others, stood a second, perhaps, with it in his hand, and then showed it to the President’s messenger, who was sitting just below him. Whether the messenger took the card into the box, or after looking at it, allowed him to go in, I do not know; but, in a moment or two more, I saw him through the door . . . and close the door. What did Booth do next? Once Booth entered the door, he was in a dark, narrow vestibule. Booth barred the door he had just entered with a pine bar—wood from a music stand he had placed there earlier in the day. . Ahead and to the left was the door to box 7; straight ahead was the door to box 8 (sketched below). Although there is some disagreement about which door Booth used, most believe that the door to box 7 was locked and the door to box 8 was open. Did Booth carve a peephole into the door of box 7 earlier that day? Many think that he did, but the proprietor of Ford’s Theatre strongly disputed this idea. He claimed it was already there so that the theatre could check on the security of the occupants of the box without disturbing them. I say again and unequivocally that John Wilkes Booth did not bore the hole in the door leading to the box President Lincoln occupied the night of the assassination. . . . The hole was bored by my father, Harry Clay Ford, or rather on his orders . . . [to] allow the guard, one Parker, easy opportunity whenever he so desired to look into the box rather than to check on the Presidential party. 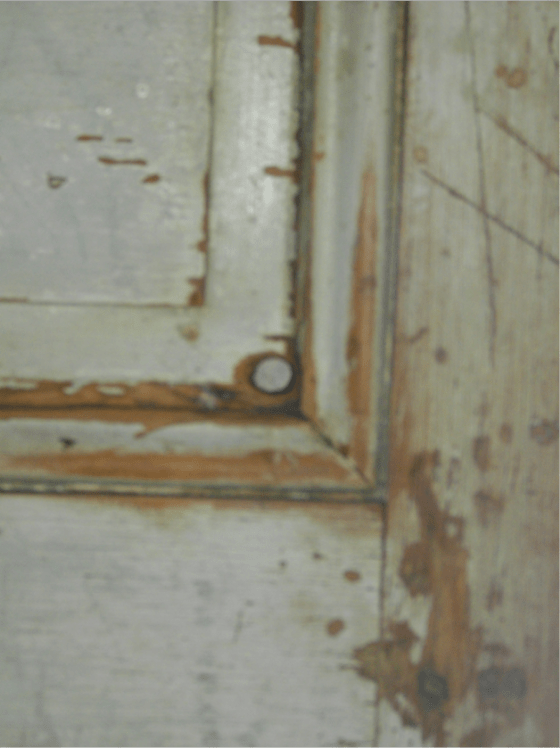 A close-up shows the hole Booth may have peered through to see the President. It is on a panel about three feet down from the top of the door. The distance between the President as he sat and the door was about four or five feet. The door, according to [my] recollection, was not closed during the evening. What weapons was Booth carrying? With his right hand he pulled from his pocket a derringer pistol. 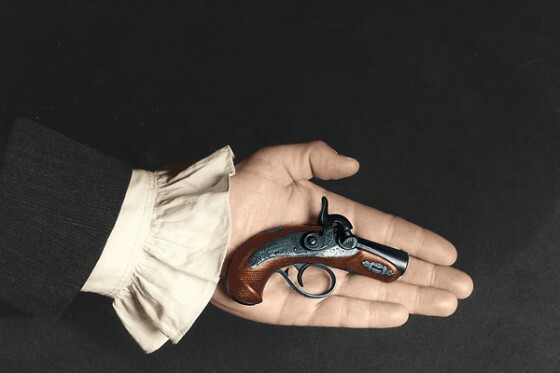 It was only 5.87 inches long (easily concealed in the palm of one’s hand) and weighed 8 oz. It contained a single .41 caliber lead ball—half an inch in diameter. 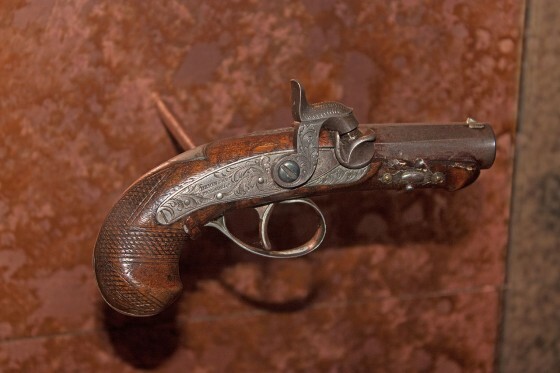 Booth later dropped the gun in the presidential box. What was happening in the play? During Act III, Scene 2, the character of Asa Trenchard (played by Harry Hawk) said to Mrs. Mountchessington: “Don’t know the manners of good society, eh? Well, I guess I know enough to turn you inside out, old gal—you sockdologizing old man-trap.” Booth undoubtedly knew that (1) this line meant that Hawk would be the only actor on the stage when it was delivered, and that (2) it would receive loud laughter. His shot rang out as the line concluded. Did anyone actually witness the assassination? 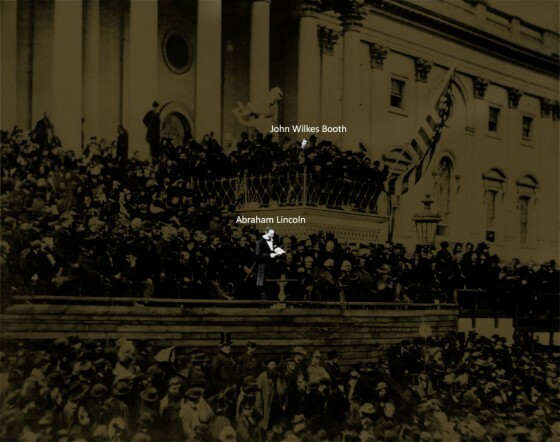 John Wilkes Booth is the only person who saw the President directly shot. 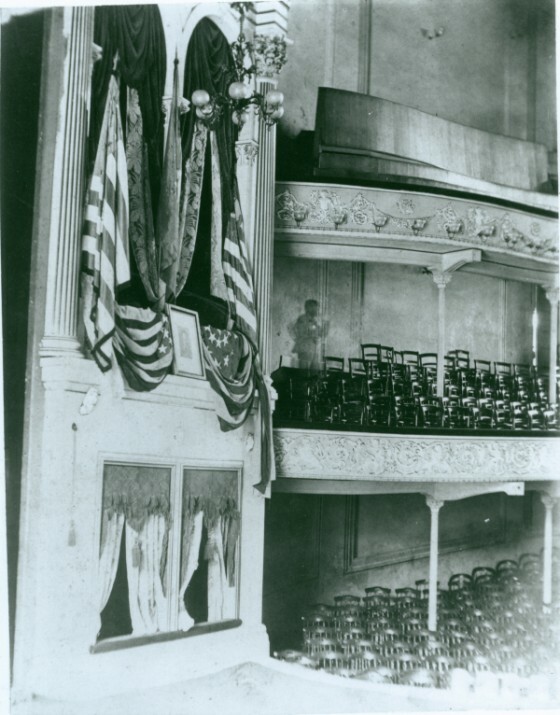 President Lincoln was not fully visible to the audience, most of the audience was watching the play (including Lincoln’s wife and guests), and Booth approached him from behind.
. . . he heard in a moment the explosion of a pistol, saw the smoke, and then saw Booth rush to the front of the box, throw his left hand on the railing, draw a knife from his left side and then though that gentleman [Rathbone] from behind caught his coat. The post that divides the two boxes prevented him from seeing the struggle there, which lasted but a moment. 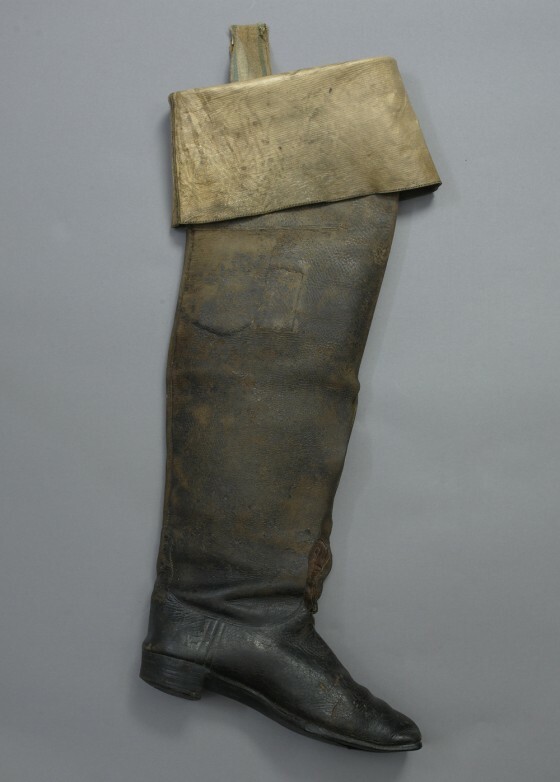 It seemed however that Booth had struck somebody back with his knife, and he then cried out “revenge for the South” and jumped from the box; and his spur upon his right heel caught in the blue flat that hung from the box and pulled it down to the floor. He [=Ferguson] saw it fluttering in the air as it went down, and saw it pulled up part way across the stage with him. 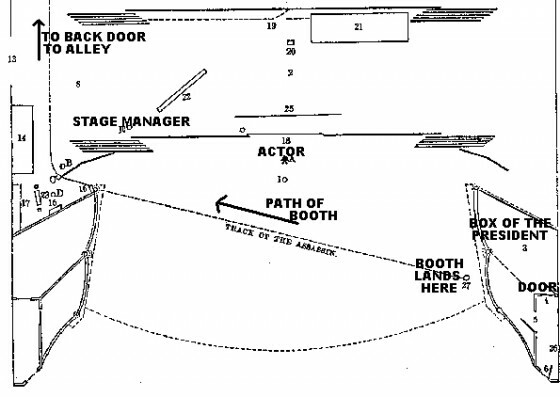 When he [=Booth] let his hold of the railing go he fell on his right knee, threw down his hands with his knife in his right hand and fled across the stage in quite a theatrical attitude. Note in the photograph below the flag on the right side of the box pulled down. I again looked toward the stage and was pleased with the amusing part then being performed, but soon heard the report of a pistol, and about a minute or two after I saw a man with dark hair and bright black eyes, leap from the box to the stage below, while descending he threw himself a little forward and raised his shining dagger in the air, which reflected the light as though it had been a diamond, when he struck the stage he stumbled a little forward but with a bound regained the use of his limbs and ran to the opposite side of the stage soon disappearing behind the scenes. I then heard cries that the President had been murdered which were followed by those of “Kill the murderer” “Shoot him” etc which came from different parts of the audience. What was the path of the bullet? 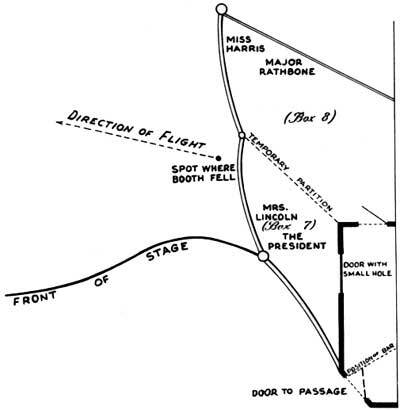 Lincoln was shot on the left back side of his head. 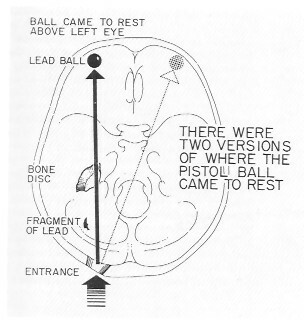 But the medical reports and autopsy are contradictory regarding the path of the bullet: did it come to come above his left eye or his right eye? The President at the time of the assassination was sitting with his elbow on the rim of the box that ran across it, with his right hand up, and he had a curtain pulled around looking between the post and the curtain at some person down in the audience. If this is accurate and the President had just turned to the left, then a diagonal bullet path would make sense. What did Booth say after he shot the President? Like many things that night, the details depend on eyewitnesses, and they don’t always agree. As noted above, Major Rathbone thought he heard him say “Freedom!” in the box after the shooting. Several witnesses recall Booth standing on the stage and shouting, “Sic semper tyrannis” (Latin for “thus to all tyrants”—the state motto for Virginia and what Brutus allegedly said during the assassination of Julius Caesar). 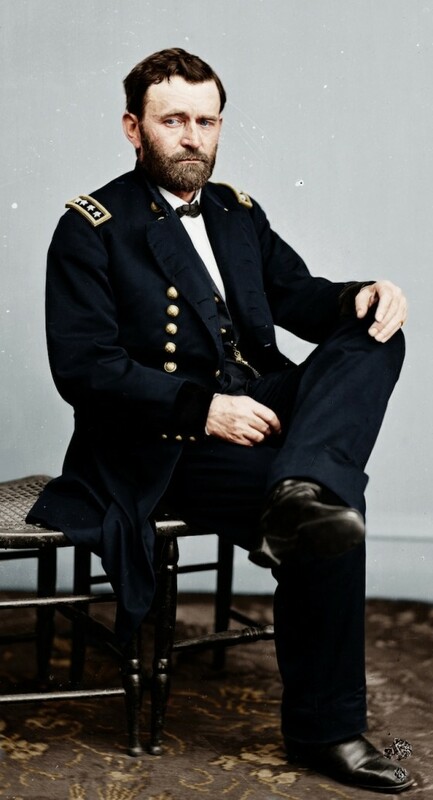 Booth wrote in his diary, “I shouted Sic semper before I fired.” This is highly doubtful. It would have been an enormous risk to announce his presence. Further, I don’t know of any independent collaboration for this, and it may have been a way to downplay the (true) charge that he shot an unarmed man in the back of the head without warning. Some witnesses also recall Booth shouting, “The South is avenged!” before exiting stage right. 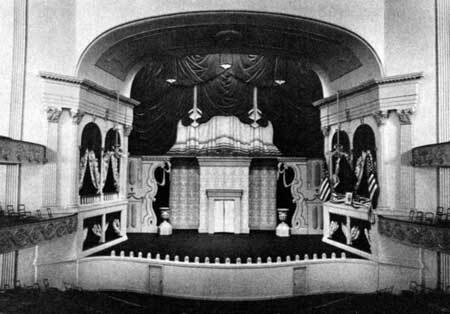 James Ferguson, sitting near the stage, recalls Booth saying “Sic semper tyrannis” as he arose from his awkward jump, and then exclaimed to himself as he headed toward the wing of the stage, “I have done it!” Ferguson also has Booth saying, “Revenge for the South,” while still in the box before his jump. He jumped from the box to the stage (a distance of 11-12 feet), made his theatrical comments, and then headed for the wing to exit. Booth tells us in his diary that he broke his leg during the jump. Because the witnesses don’t reference a limp as he strode across the stage, Booth biographer Michael Kaufman thinks that this jump refers to a subsequent incident with his horse. Why did Booth shoot Lincoln? He was dedicated to white supremacy and to the cause of the Confederacy, but his ego demanded that he serve that cause in some fashion more dramatic than shouldering a musket in Lee’s infantry. . . . After the fall of Richmond on April 3, 1865, Booth imagined that killing the president would still somehow save the Confederacy from defeat or at least prevent Lincoln from reshaping the South. . . . Booth saw himself as a hero of liberty who would be remembered forever for slaying an evil tyrant. In a lengthy letter to the editor of the National Intelligencer, written before the deed was done, Booth made his ideology explicit: “This country was formed for the white, not for the black man . . . If the South is to be aided it must be done quickly.” At the close of his letter he compared himself to Brutus—his father’s middle name—who had assassinated Julius Caesar for being a tyrant. God cannot pardon me if I have done wrong. Yet I cannot see my wrong, except in serving a degenerate people. . . . God, try and forgive me, and bless my mother. . . . I do not repent the blow I struck. I may before my God, but not to man. I think I have done well. Though I am abandoned, with the curse of Cain upon me, when, if the world knew my heart, that one blow would have made me great, though I did desire no greatness. Tonight I try to escape these bloodhounds once more. Who, who can read his fate? God’s will be done. I have too great a soul to die like a criminal. Oh, may He, may He spare me that, and let me die bravely. I bless the entire world. Have never hated or wronged anyone. This last was not a wrong, unless God deems it so, and it’s with Him to damn or bless me. As for this brave boy with me, who often prays (yes, before and since) with a true and sincere heart—was it crime in him? If so, why can he pray the same? Where was Lincoln taken after he was shot? 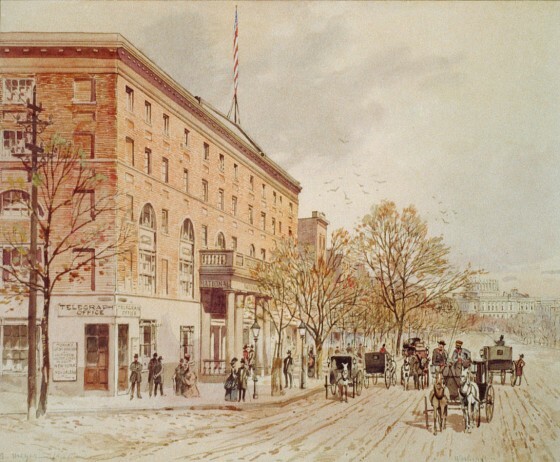 Lincoln was carried headfirst down the staircase of Ford’s Theatre, out the front doors, and onto 10th Street. There was an officer present who rendered great assistance in making a passage through the crowd. When we arrived to the street I was asked to place him in a carriage and remove him to the White House, this I refused to do being fearful that he would die as soon as he would be placed in an upright position. I said that I wished to take him to the nearest house, and place him comfortably in bed. We slowly crossed the street there being a barrier of men on each side of an open passage towards the house. Those who went ahead of us reported that the house directly opposite was closed. I saw a man standing at the door of Mr. Peterson’s house and beckoning us to enter which we did and immediately placed him in bed, all of which was done in less than twenty minutes from the time that he had been assassinated we not having been in the slightest interrupted while removing him. What did the Peterson House look like then? 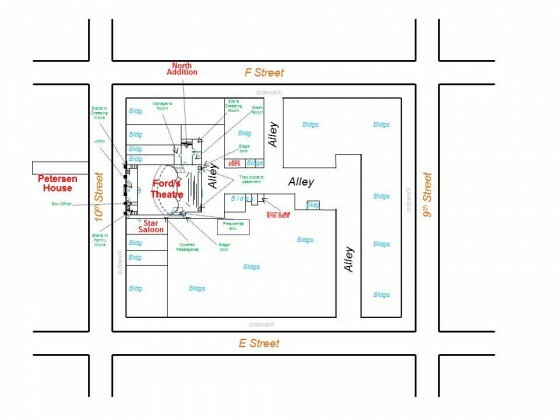 Were there any artists witnessing the events of that evening outside Ford’s Theatre? Funny you should ask! 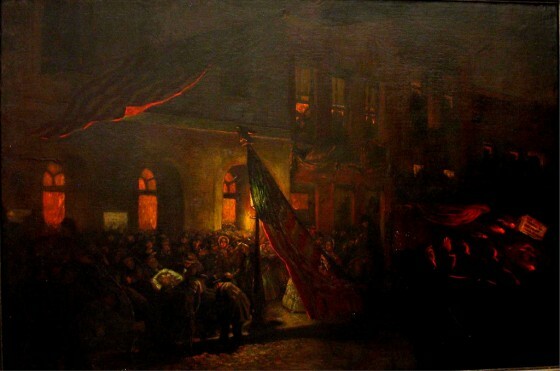 Artist Carl R. Bersch witnessed the scene from his window, was able to make a sketch, and later produced a painting entitled “Borne by Loving Hands.” To my knowledge it is the only artwork that night captured by an eyewitness (though later artwork was quickly made based upon eyewitness interviews). For whatever reason, the painting does not seem to be well known today. 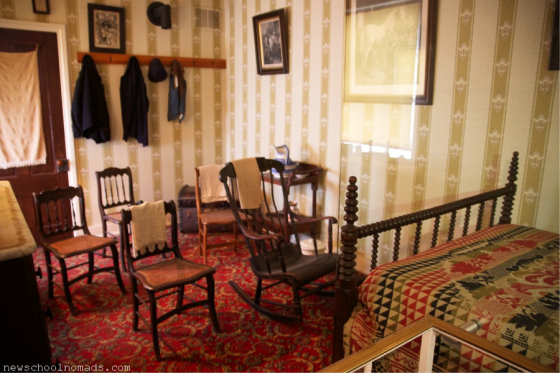 What room was Lincoln taken to within the Peterson house? He was taken to the first open room, at the back of the house and on the first floor. It was rented by William (“Willie”) Clark, a former private in the 13th Massachusetts who was working at the time as a clerk in the Quartermaster’s Department. He was out for the evening. 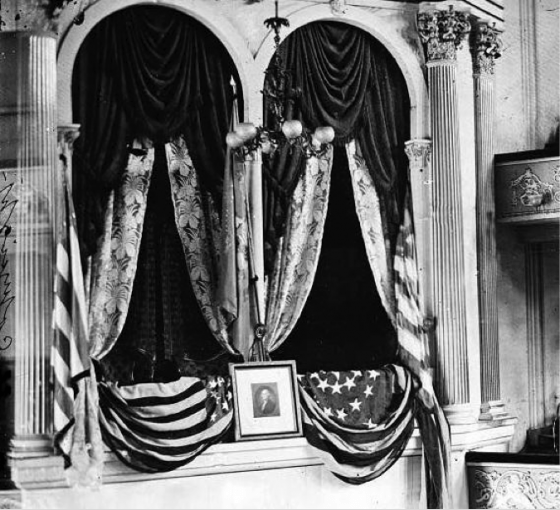 How big was the room where Lincoln died? It was nearly 9.5-feet wide by 17-feet long. 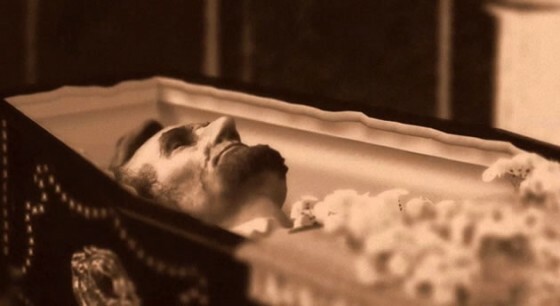 The photograph below was taken by Peterson house boarder Julius Ulke just a couple of hours after Lincoln’s body had been removed. The blood on the pillow from the President’s head was still sticky to the touch. 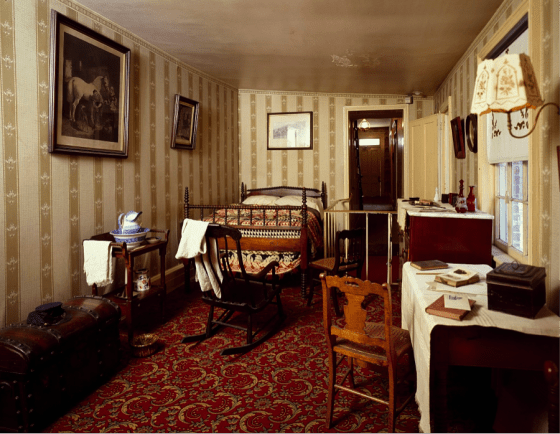 What does the reconstructed room look like today? The furniture in the room are period pieces. The actual bed is on display at the Chicago Historical Society. 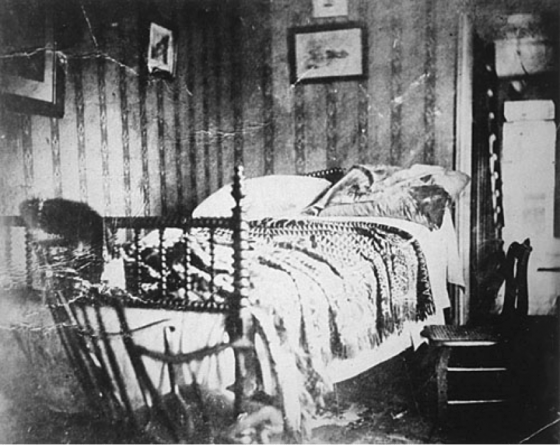 The bed was 78 inches long, and Lincoln was 76 inches tall (6’4″)—add a pillow and he wouldn’t fit. So they had to lay his body diagonally across the bed and removed a part of the foot of the bed. They opened the windows and had everyone leave who was not a part of the medical team or a friend. Does the bloodstained pillow still exist? 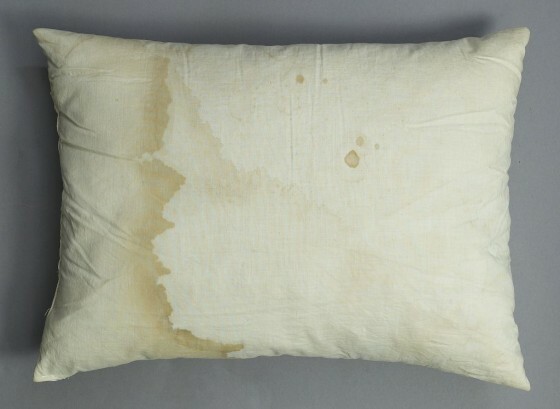 Yes, one of the pillows Lincoln used is pictured below. 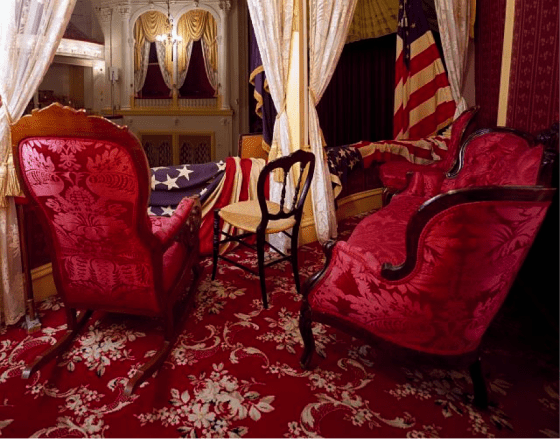 How many people were in the room where Lincoln died? The room was not big enough to hold many people at one time. It is often called the “Rubber Room” because of the way in which it magically expands in depictions of the scene to accommodate the dozens of people—family members, doctors, cabinet members, friends—who visited the dying President. Alonzo Chappel’s “The Last Hours of Abraham Lincoln” is simultaneously the most inaccurate rendering (in terms of the size of the room) but beautifully accurate (in its depictions of the people who were there at some point or another). Many of the people shown—including Robert Lincoln and Clara Harris—posed for Chappel so that he could portray a realistic likeness. Go here for more details on this painting and other paintings of the scene. How much time elapsed between when Lincoln was shot and when he died? He was shot between 10:15 and 10:30 PM on Friday night and died the following morning at 7:22 AM (+ 10 seconds). So he was unconscious for approximately nine hours before dying. 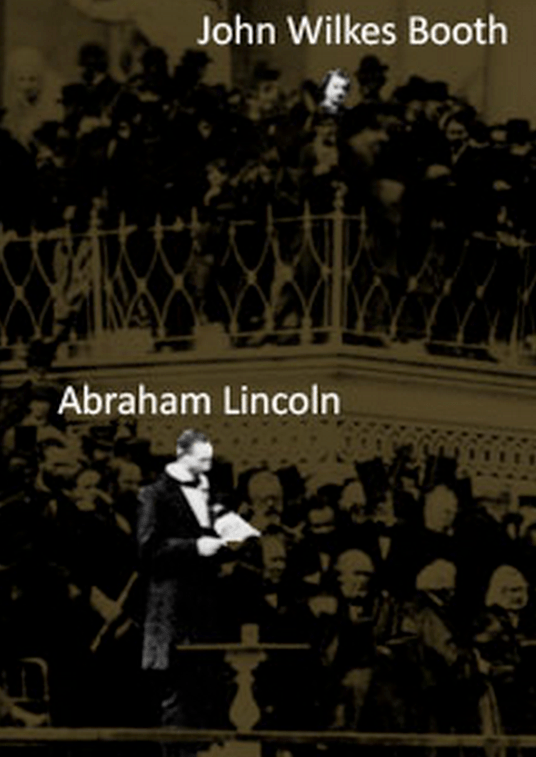 What did Edwin Stanton say after Lincoln died? No one knows for sure, but—for what it’s worth—I think “angels” is more probable. There is a principle in textual criticism that the “harder reading” is to be preferred, and it intuitively seems more likely that someone would revise “angels” to “ages” rather than vice-versa. “Ages” seems more poetic and memorable, whereas “angels” is a bit more unusual and obscure. Furthermore, Stanton (himself a religious man) uttered this line immediately after a prayer was delivered. Ultimately, we cannot know for certain. Are there any photographs of Lincoln after he died? 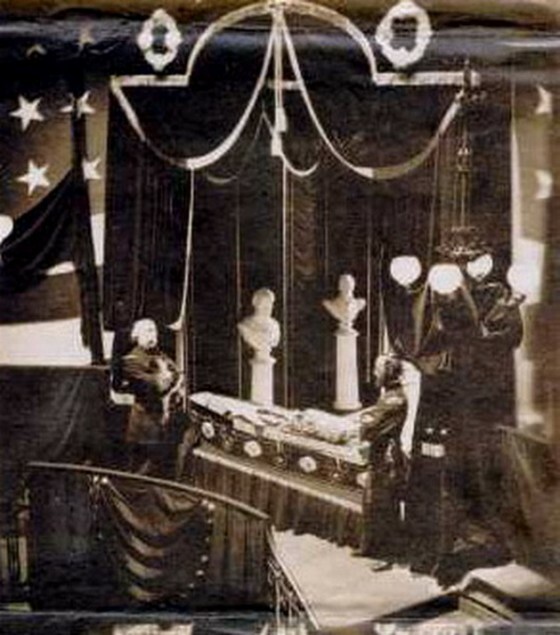 The last extant photograph of Abraham Lincoln is of his corpse in repose, taken on April 24, 1865, in New York City—nine days after his death. 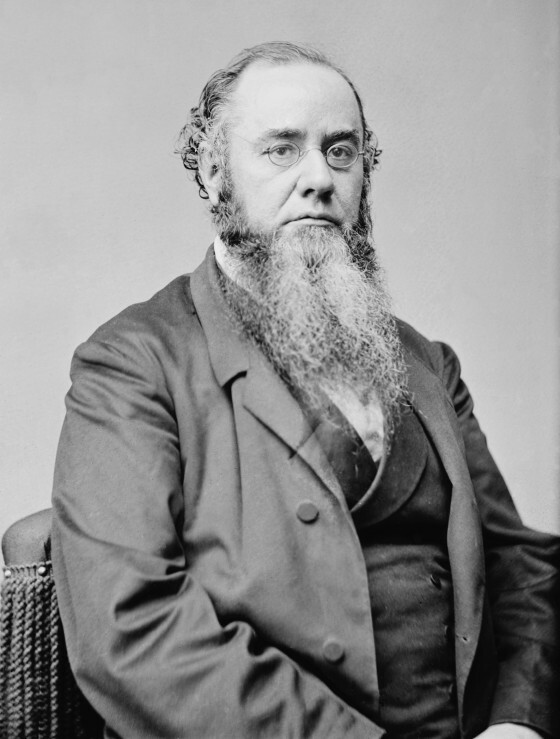 Secretary of State Edwin Stanton had ordered the photograph destroyed. It was discovered in 1952 by a 14-year-old Ronald Rietveld, who went on to become a historian. Hey, how come you didn’t answer my question? Because this blog post is already too long! There are so many other fascinating threads and angles to this story. We haven’t even touched on the other assassination attempts on Lincoln’s life (there were at least eight), or Booth’s plan for a simultaneous attack to take out the Union government (Lewis Powell tried but failed to kill Secretary of State William Seward, recuperating in bed from a carriage accident, while George Atzerodt failed to attempt an assassination on Vice President Andrew Johnson), or what happened to Booth’s co-conspirators (they were hanged after a trial), or whether better medical care could have kept Lincoln alive (it is extremely doubtful), or the funeral train that carried Lincoln’s body and the exhumed body of his young son back to Springfield, Illinois, or other “facts” that are likely myths (like Lincoln saying an unusual “goodbye” rather than “good-night” before he left, or that Lincoln had a dream about attending his own funeral, or the idea that Secretary Stanton was behind the assassination, or that Dr. Mudd was an innocent man wrongly condemned by a vengeful government, or that Booth actually survived, or that there was a mummy of Booth, etc.). Some of the issues and events surrounding the key players are stranger than fiction (like Major Rathbone later killing his wife, Clara Harris Rathbone, or Mrs. Lincoln trying to contact her dead husband through spiritualists, or thieves later attempting to exhume and steal Lincoln’s corpse). Because the event is so iconic in American history, it is easier for us to forget the true nature of the event. Whether one agrees or disagrees with Lincoln’s policies and how he led the country through war, this was a violent and cowardly murder of not only the leader of the country, but also a husband, a father, and a friend—and a man created in the image of God—all to perpetuate the evil ideology of white supremacy and black subjugation. 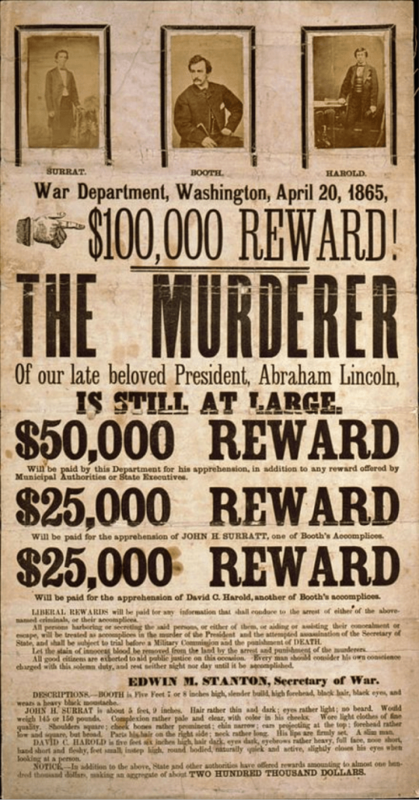 Where can I read more about the assassination of Lincoln? Amazingly, the first book published on the assassination by a professional historian was not until 1983: The Lincoln Murder Conspiracies by William Hanchett. If you want an excellent biography of Booth, get Michael Kaufman’s American Brutus: John Wilkes Booth and the Lincoln Conspiracies. If you want the best fact-filled, easy-to-use reference guide, get Edward Steers Jr.’s The Lincoln Assassination Encyclopedia. It’s a must-read for any history buff interested in the assassination. Steers is often considered our foremost expert on the assassination; see also his detailed Blood on the Moon: The Assassination of Abraham Lincoln. If you want excellent history with unputdownable narrative, with a focus on the subsequent manhunt, get James Swanson’s New York Times bestseller, Manhunt: The 12-Day Hunt for Lincoln’s Killer. (Swanson has also written a follow-up book, Bloody Crimes: The Funeral of Abraham Lincoln and the Chase for Jefferson Davis). For eyewitness accounts of the actual night, see We Saw Lincoln Shot: One Hundred Eyewitness Accounts. For online resources, I find the Boothie Barn site by Dave Taylor (no relation) indispensable for thoughtful research not found elsewhere. If you like FAQ formats (i.e., if you made it to the end of this post! ), you will like Gerald Prokopowicz’s entertaining but accurate and informative Did Lincoln Own Slaves? And Other Frequently Asked Questions about Abraham Lincoln. Finally, are there any good film reenactments you’d recommend? 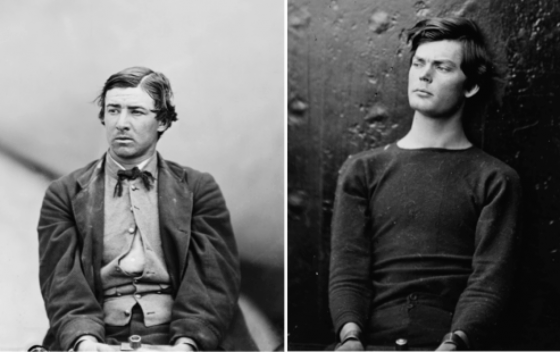 On the assassination itself, I think The Conspirator has a relatively accurate reconstruction of the assassination, along with Powell’s savage attack on Seward and Atzerodt’ failure to assassinate Johnson. At least for the time being, you can watch the relevant clip here, with foreign-language subtitles (feel free to skip 1:39 to 2:19). Francis of Assisi has little to answer for. Although the quotation of ‘preach the gospel at all times; use words if necessary’ has been attributed to him, the historical truth of the matter is that Francis was a prolific gospel preacher. However, in a contemporary world of increasing political (and seemingly ecclesiastical) correctness, the unspeaking Christian is a welcome guest at the public square party; and as such, a ‘nice’, domesticated Francis sits better within this context than a fiery gospel-preaching Francis. The cosy alternative to gospel preaching, of course, is to witness in lifestyle only, or as some within the contemporary church are suggesting; to live the ‘way of Jesus’. In this method of being a ‘light to the Gentiles’ (Acts 13:47), when a believer in Jesus Christ lives out in a visible way the inner convictions of the soul, then that is, in itself, contemporary evangelism. There are at least three difficulties with this posture. First, evangelism is evangel-ism. In other words, the evangel must be an integral part of our evangelism. The evangel, based on the Greek words euaggelizo or euanggelion, is widely translated as either an announcement, or as good news; as a declaration, or as preaching. This then means that evangel-ism is a spoken practice. It is certainly not a ‘silent witness’. However, in our current framework of postmodern subjectivism, somehow certain sections of the Christian church have rewritten the discipline of linguistics to reprove Greek scholars by suggesting that the evangel can be a gagged display. In order to be faithful to the biblical text, this suggestion must be bluntly refuted. Second, there is a theological record of evangelism in the Gospels and particularly in the book of Acts. Contrary to how some progressive Christian writers and thinkers believe, Jesus of Nazareth was a preacher (Matt. 4:17). Not only was he a preacher, but he was a preacher of repentance: an evangelist. His parting command to the disciples/apostles was for them to become witnesses (transl. ‘martyr’). If Jesus’ followers were to ultimately give their lives for the sake of the gospel – the evangel – it would certainly not be for being ‘good’ men. This drama of how to be a witness is explicitly covered in the missionary endeavours of Paul and his companions as they travel around the Mediterranean. They do not go from town to town with a strategy of silent works; they preach, challenge, cajole, rebuke, bless – all the while utilising their voices in doing so. They gain some converts and upset many others. They are hailed as gods and yet at times left for dead. Paul’s own account of suffering and joy is recorded in 2 Corinthians 11. The events of this dramatic chapter did not merely come about because Paul travelled around carrying out good deeds everywhere he went. Paul was a preacher, like his Saviour before him. The theological record is a standing rebuke to those who suggest that evangelism is best carried out in silence. Third, practically, evangelism which is only visible does not work. I have been an evangelist for 12 years, working with British Forces in Germany. I have been generous in my time, money, gift-giving, and ministry. However, there are many others within my working context who are also generous in these and many other ways. I believe in the argument of being a visible witness – but this is not evangelism. Evangelism can only take place when we speak. It does not happen by osmosis. The regular soldier I am trying to be a witness to does not see me carrying a heavy box from the post room to help a struggling soldier and automatically equate that to the gospel of Jesus Christ. If I buy a soldier a coffee, that act is not understood as explaining the atonement. If I help train boxers for an upcoming fight, that is not perceived as reflecting the salvific work of the cross. The only way this can be transmitted is by words, either spoken or written. In other words, evangelism is effective only when the evangel is delivered; the good news of Jesus Christ offered as a sacrifice for our sin, and by doing so welcoming sinners to receive his grace and forgiveness via repentance. The gagging of the Church takes place when we submit to cultural pressures and try to become silent witnesses. This method does not express the evangel; it flies in the face of biblical theology; and, in the end, is neither relevant nor effective. As challenging as it may be – it is certainly not an easy task (it is a lot easier to be a silent worker of good deeds) – let us allow the evangel to become a part of our evangelism; let us continue the theological mandate of speaking to those who do not know Jesus Christ; and let us practically, by visible witness and certainly by spoken or written word, transmit the redemptive story to a world lost in ambiguity, self-fulfilment, and, tragically, in judgment-inducing sin. It is Ligonier’s desire to serve the church in fulfilling the Great Commission. This survey has helped to point out common gaps in theological knowledge and awareness so that Christians might be more effective in the proclamation, teaching, and defense of the essential truths of the Christian faith. Dude Perfect: Glow in the Dark Edition! Dungy was eviscerated shortly after his statement by a columnist named Dan Wetzel onYahooSports.com. I hadn’t previously heard of Dan Wetzel and, between us, he and I have won zero Super Bowls and have zero years of NFL playing or coaching experience. The subtext in that last sentence, in case you missed it, is that Dungy is qualified to speak to NFL-related issues in a way that we are not, given that he has played in the league and won multiple Super Bowl rings. It was all very Huffington Post except that it was published on Yahoo Sports. And Wetzel isn’t really even the issue, as you can count on a similar article being written be many other columnists over the next 24 hours. From an athletic standpoint, Michael Sam is not Jackie Robinson. Jackie Robinson was a singular talent who gave his team an undeniable competitive advantage. Lest we semi-saint Branch Rickey, there was a good dose of rational self-interest in his compulsion to sign Jackie Robinson in spite of the upheaval he knew it would create. By contrast, Sam is a seventh-round draft choice who may or may not make it. If Sam is Lawrence Taylor, then this is a different discussion. A few years ago, when everybody said, “I don’t want to sign Tim Tebow because of the media circus that comes with Tim Tebow” almost nobody defended him. In fact, most of us nodded our heads in agreement (I did, even though Tebow and I share a common faith). To me, Sam presents a similar situation. It’s a question of “Do I want to draft or sign a marginal prospect who comes with a lot of media-related baggage? Is he worth it?” The answer, with Tebow, was “No, he isn’t.” To suggest that teams or coaches are somehow morally obligated to give opportunities to certain players is a slippery slope. Must every backfield contain a Christian, a Muslim, and an atheist in order to be morally acceptable? If Tebow were Dan Marino, his discussion would have also been different. Should all the teams that passed on Johnny Manziel because of Manziel’s lifestyle be similarly castigated? I care about who Johnny Manziel sleeps with about as much as a care about who Michael Sam sleeps with, which is to say not at all. A lot of teams ostensibly passed on Manziel because of his partying “lifestyle,” which is Manziel’s choice and may or may not affect his employment. As of now, there are zero HuffPo-type articles talking about what a “courageous young man” Manziel is for flying to Vegas on the weekend to be photographed with a bevy of young party girls. An article like Wetzel’s puts him in the tenuous position of moral arbiter. I remember a time, not too terribly long ago, when Dungy was on the other side of a similar discussion. Citing the dearth of African American coaches in the league, commentators allowed only one culturally acceptable stance on whether or not teams should hire him. Now, a few years later, Dungy has proven himself in the marketplace. He became the first African American head coach to win a Super Bowl, and he won an audience for his bestselling books. The NFL (in my opinion) is better for his success. The same thing may or may not happen as naturally for Sam. My point is that Sam doesn’t need (and probably doesn’t want) the media telling the culture what to think about his sexuality. Is Rams head coach Jeff Fisher suddenly the bad guy if he decides to cut Sam? Or is he still the good guy who decided to draft him in the first place? This might be the no-win situation that Dungy would have wanted to avoid. But what Sam has, starting now, is a training camp invite and an opportunity to prove himself in the marketplace, which is, ostensibly, a very American thing to have. Ted Kluck is the award-winning author of more than a dozen books. Visit him online at www.tedkluck.com. Was the Revolutionary War Sinful? In 1763 the French stopped attacking the American Colonies. The British rulers imposed new taxes on the Colonies to show their authority and power over them. The Colonies saw these as illegitimate because they had little American representation in British government; therefore they had no choice in the matter. In response to these taxes and some trade regulations on the Colonies, the Americans formed their own Provincial Congress in each Colony. In 1774 these Provincial Congress’s became united in their rejection of the British taxes and created the first Continental Congress. In response to this rejection Britain sent combat troops to Boston and the fighting began in 1775. After another year, the Continental Congress wrote up what they called, the Declaration of Independence, which rejected the British Monarchy and its parliament. In 1778 America allied with France, and Britain slowly lost control of the Colonies after large battles in Saratoga (1777) and Yorktown (1781). The Treaty of Paris was signed in 1783, which ended the fighting and all British rule over the Colonies. America was free, just as they wanted. I think Paul’s point is hard but clear. We ought to submit to the governing authorities because in doing so we submit to God. Notice that Paul says to submit to the government as it is not as it ought to be. Paul’s point becomes especially clear when you realize that he is writing during Emperor Nero’s rule. How does this make Paul’s point clearer? Nero persecuted the Church more than any ruler to this present day. He would often sew up Christians inside animal skins and let lions loose on them, to be eaten alive. He would also dip Christians in oil, tie them to poles in his garden, and light them on fire to light his garden during the night. Yet Paul says, submit to the governing authorities, submit to Nero. I know that some (maybe most) will view me as being unpatriotic because of this; but shall we honor country above God and His Word? No. The 4th of July is the day America celebrates our disobedience to Romans 13. I am not anti-American, I’m from here, and I do enjoy living here. I’m thankful for those who gave their lives to purchase our freedom. But I will submit to the government in everything as Romans 13 calls me and every other person to do. I will not submit to anything this country commands that God has forbidden in His Word. What is my aim in telling you these things? I simply want you to view history more through God’s Word than through patriotism. I want you to be more Christian than American. What does this mean about celebrating July 4th? Do I think those who celebrate are sinful? Yes and no. Yes, because the War was sinful. No, because we are celebrating God’s goodness to us in spite of our sin (He has blessed our nation in spite of our sin). We ought to remember on the 4th of July that God has given us ultimate freedom, not from man’s rule and man’s taxes; but from the world, the flesh, and the devil, by the blood of His Son, Jesus Christ. Would you join me in the submission we are called to in Romans 13? If you haven’t heard about this yet, you should probably be brought up to speed. Below is an article you need to read. Am I Closer to God Because of My Religion? This was my thought process. I laughed because the question would seem completely absurd in any other century than our own. Why? Because we seem to have a curious notion prevailing in our day as opposed to every other time in history that one cannot claim to know what Truth is, if one even contains a category of Truth at all. Well, not every conversation goes in my favor as the one above does. Haha, few do. But can you see that it really does come down to a battle of belief? I really do believe that the God of the Bible is the only God, the objective Fact that all men must one day deal with, who exists apart from us, regardless of what we believe or not. And, it doens’t matter if this is popular or not, it’s true.